To save money from upgrading your factory radio, you can install your new head unit on your own. If you have some related experience and a correct installation guide, it’s easier for you to fulfill the installation by yourself. 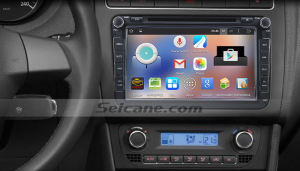 Please look at the image below, which is a multifunctional 2005-2013 VW Volkswagen SAGITR head unit from Seicane after installation. If you also have the same dashboard, you can refer to the following step-by-step installation guide for your installation. Step1: Remove the trim panel. Please pry around the trim panel with a lever. While prying, please loosen the trim panel with your hand. When the trim panel is loosened, please remove the trim panel off the dashboard and gently place it aside for further removal. Step2: Remove the four screws on the radio. Please unscrew the four screws which are holding the radio at four corners with a screwdriver. Then keep them well in a small box for the installation of a new radio. Step3: Take the factory radio out of the dash. After the four screws are unscrewed, you can easily pull the factory radio out of the dash. Step4: Disconnect the wiring harness. Before you put the factory radio aside, please disconnect the wiring harness at the back of it. Step 5: Connect the new Seicane head unit to the original wiring harness as the user manual or the wiring diagram shows. Step 6: Turn on the new Seicane head unit to have a careful check if everything works well. If it doesn’t, please check whether all the cables are connected correctly. Step 7: Put the new Seicane head unit into the dash and install four screws. Step 8: Install the trim panel into its original place. Wish the above installation guide can be helpful for you. It’s normal that if you find the dashboard shown in the guide is different from yours, because cars in different years may come with different dashboards. But the installation is similar as a whole. Make sure you are clear about every step before you start to install. Designed both as a GPS navigation system and a DVD player, this VW Volkswagen SAGITR head unit will be great help for you to find the best way to your destination and have fun during the whole driving. The Bluetooth technology enables you to pair your mobile phone which has Bluetooth feature with this unit, so that you can keep your eyes on the roads and your hands on the steering wheel control to have a safe driving, besides, the Bluetooth music is available in this way for you to get access to relaxation all the time. Take your car capabilities and your driving experience up a notch, this VW Volkswagen SAGITR head unit is just the best choice for you! What are you waiting for?